Instant Help Publications, 9781626254985, 184pp. If you struggle with overeating, you are not alone. 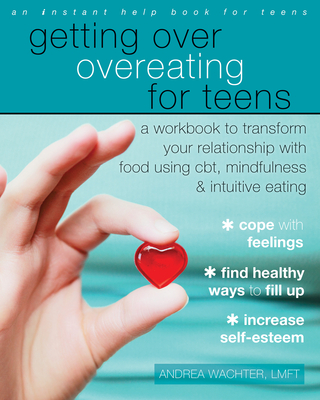 Studies show that millions of teens face problems with emotional eating, weight gain, and negative body image. However, these facts and figures do not include sneak eaters, overeaters who do not binge, and teens who overeat but manage their weight through excessive exercise. So, if you're struggling with the habit of overeating, where can you turn? With the practical advice and powerful exercises in this book, you'll come to a better understanding of your urge to overeat, and learn skills such as emotion regulation, assertive communication, moderate eating, and working with cravings. Most importantly, you'll find better ways to fill up and be ready to apply what you've learned to living a healthier, happier life. Andrea Wachter, LMFT, is coauthor of The Don't Diet, Live-It! Workbook and Mirror, Mirror on the Wall: Breaking the "I Feel Fat" Spell. She has over twenty-five years of experience working with children, teens, adults, families, and groups. Wachter is passionate about helping people who are struggling with eating disorders, body image, substance abuse, depression, anxiety, grief, and relationships. She is an inspirational counselor, author, and speaker who uses professional expertise, humor, and personal recovery to help others. Check out her Huffington Post blogs at www.andreawachter.com.